The building's owner, Columbia REI, has a demolition permit from the city and interior work is underway. Attorney Francis Barrett, representing the owner, said the party seeking the restraining order did not have a case. "No standing, no grounds, no irreparable harm, no reason, no justification," Barrett said. "There's been a process that played out and that process was followed and it's basically over." Woods Real Estate Investments filed a motion last week seeking the restraining order. The family owns several properties near the Dennison building. Woods' attorney Tabitha Hochscheid said the firm has been involved with the issue. She said Matt Woods offered testimony before the city's Historic Conservation Board. "He told them about buying an old building and restoring it and talking about how these buildings are gems and how we should preserve those," Hochscheid said. "And they don't feel like that's enough for him to be able to challenge what they did." Matt Woods said his family will consider its options. "We clearly have a vision that is different than what the Joseph family has," Wood said. "And we feel like we're the future of Cincinnati, let's preserve what we have and really treasure what our past is. And we feel that they have a completely different vision, which is creating a big hole in our urban core." Barrett said interior demolition work at the Dennison is underway, and planning continues for exterior work. Columbia REI has argued the building cannot be saved, and there is no economical plan to preserve it. In June, Cincinnati's Historic Conservation board ruled the owners could not tear it down. It denied a certificate of appropriateness to demolish the building. "The owner has not demonstrated to the satisfaction of the Historic Conservation Board that the structure cannot be reused nor can a reasonable economic return be gained from the use of all or part of the building proposed for demolition," said board member Judith Spraul-Schmidt in reading the motion, in June. "And finding second that the property owner has not demonstrated by the preponderance of the credible evidence that it will suffer economic hardship because the applicant did not consider the use of tax credits and the applicant has not offered the property for sale." 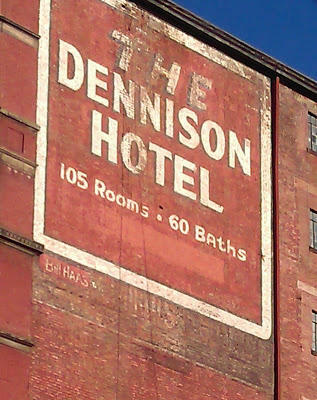 The board agreed with the city's urban conservator who found there could be an economically viable use for the Dennison. Columbia REI appealed that decision to the city's Zoning Board of Appeals. The body ruled in December, reversing the Historic Conservation Board, that the building could be demolished. Cincinnati officials issued a demolition permit on January 31.